Are you a professional coach (or other self-employed professional) who has to market your own practice? Are you great at what you do, but hate or fear marketing? 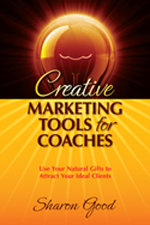 Creative Marketing Tools for Coaches helps you to explore your natural gifts and talents, and then use them to put the word out about your work. The philosophy is that, by using talents and skills that you enjoy using, you're more likely to market on a regular basis. Plus, your natural enthusiasm for what you're doing will come through and attract the perfect clients to you. You'll learn the basics of doing websites, e-zines, blogs, podcasts, articles, books, audios, videos, workshops and numerous other tools, from which you can choose the ones that most appeal to you. Extensive resource lists are provided to further investigate and learn to work with the tools you select. Are you a professional coach, healer, consultant or other type of private practitioner? Do you feel stuck with your marketing? 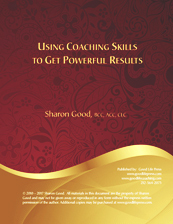 Click here to learn how to schedule a one-on-one marketing consultation with Sharon Good and receive a FREE copy of Creative Marketing Tools for Coaches. Or order from your local bookstore. NOW AVAILABLE FOR KINDLE ! ! ! Life Coaching involves a specific skill set that is used not only in individual coaching, but has infiltrated the business world. Coaching has helped thousands of people around the world to see greater possibilities for themselves, clarify new goals, and follow through to achievement with the support of their coach or manager. In this value-packed book, you'll learn the basics of coaching , including how to set up a coaching relationship and begin working with your client, along with a powerful set of coaching skills to support your clients or employees in achieving success in their life and career. According to a survey published by the US Chamber of Commerce, the thing that employees want most is not good wages or job security -- it's appreciation! Go into any business today, and the biggest complaint employees have is that they don't feel appreciated. So what can a boss do? 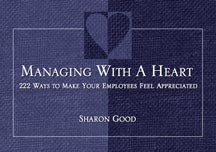 This book offers over 200 ideas -- some conventional, some fanciful -- on how to let your employees know that they're valuable to you. No business owner, supervisor or manager should be without it! Available in PDF format, this revised edition includes new materials that address the current work climate. "At last! An easy-to-read, easy-to-use set of ideas for motivating employees and motivating yourself in the process. 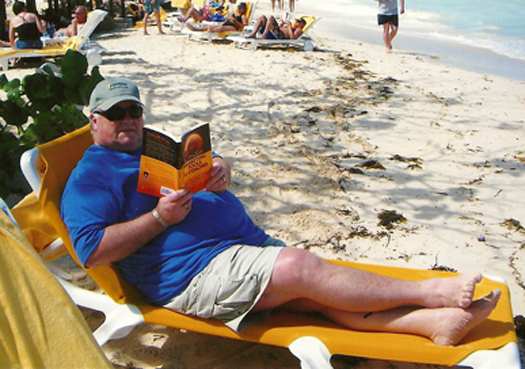 This is a book whose time has come and whose readers have been waiting. "Managing With A Heart" is well worth the wait!" -- Marlene Caroselli, Author, "The Language of Leadership"
"If it's power you're after, STOP READING NOW. If it's productivity, READ ON. If you want control, put this down. If teamwork is what you want, keep going. This book is not about being BOSS. Click here to see a sample page. © 1999 - 2019 Sharon Good. All rights reserved. Good Life Press is affiliated with Good Life Coaching Inc. (www.goodlifecoaching.com).